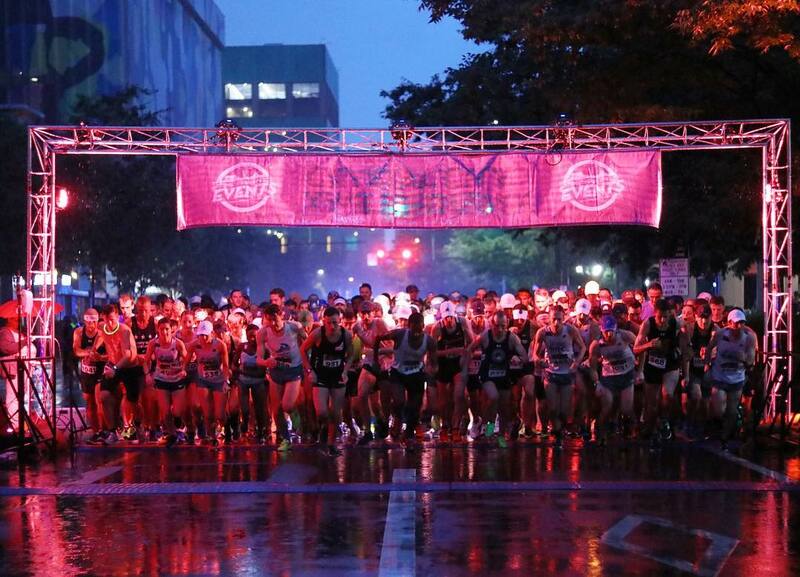 In a turn of events expected by none, this year's Crystal City Twilighter was not hot. Temperatures hovered right below a comfy 70° at the start, but with one small wrinkle: nor'easter conditions that dumped over 5" of rain on the DC area throughout the day. Regardless, as anyone with previous experience with the Twilighter can attest, running in the wettest year of the race sure beats running in the hottest year of the race. Particularly notable performances from Saturday night include 2nd place finishes from Kyle Wagener (15:28) and Emily de la Bruyere (17:38), plus some strong top-10 finishes from Kerry (18:01), newcomer Katie Read (18:05), and Emily K (18:39). Unfortunately, not too many people had their cameras out in the rain, so we'll have to make due with this singular photo that has surfaced on the 'gram. Playing catch-up on last weekend's results, Outlaw and Dickson set the track on fire at the Midsummer Night's Mile in Germantown, MD. Outlaw kicked home to 2nd place in 4:30.7, followed by Dickson in 4:37.8 after 1200m of perfect 67-second laps from expert pacer TK4.